A Roseville, Minnesota pooch has once again proven that dogs just may have a sixth sense after all — and this particular breed, an historic penchant for lifesaving. Murphy, a usually quiet Newfoundland dog would not stop barking on Wednesday morning. His owner finally let him outside. Murphy then darted straight to the fence and continued barking. The dog sensed that his 95-year-old neighbor had fallen and was helpless in the cold. Many tales have been told of the courage displayed by Newfoundlands in adventuring and lifesaving exploits. Newfoundlands exhibit a very strong propensity to rescue people from water, even without any formal training in water rescue. One Newfoundland alone once aided the rescue of 63 shipwrecked sailors. And, there are many other similar stories collected at the Wikipedia entry for the dog breed. An unnamed Newfoundland is credited for saving Napoleon Bonaparte in 1815. During his famous escape from exile on the island of Elba, rough seas knocked Napoleon overboard. A fisherman’s dog jumped into the sea, and kept Napoleon afloat until he could reach safety. In 1832, Ann Harvey of Isle aux Morts, her father, and a Newfoundland Dog named Hairyman saved over 180 Irish immigrants from the wreck of the brig Dispatch. In the early 20th century, a dog that is thought to have been a Newfoundland saved 92 people who were on a sinking ship in Newfoundland during a blizzard. The dog retrieved a rope thrown out into the turbulent waters by those on deck, and brought the rope to shore to people waiting on the beach. A breeches buoy was attached to the rope, and all those aboard the ship were able to get across to the shore. 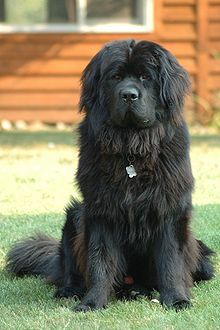 One famous Newfoundland was a dog named Seaman, who accompanied American explorers Lewis and Clark on their expedition.